A dental implant is a metal or ceramic device that replaces the root of the natural tooth. After implants are placed in the bone, artificial teeth are attached to them, enabling normal function and natural tooth appearance. Whether an implant is right for you depends on where the implant will be placed, the kind and amount of bone available in your jaw, and the design of the restoration to be placed on the implant. 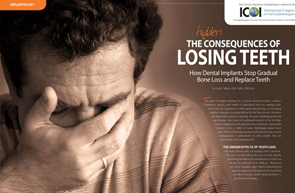 Missing teeth can affect how you feel about yourself, both personally and professionally. You may begin to hide your smile because of the spaces present. In the long term, the bones and gums around the areas where the teeth are missing will shrink. This reduces the support available to the lips and cheeks, causing them to sink into the face and giving rise to premature ageing. 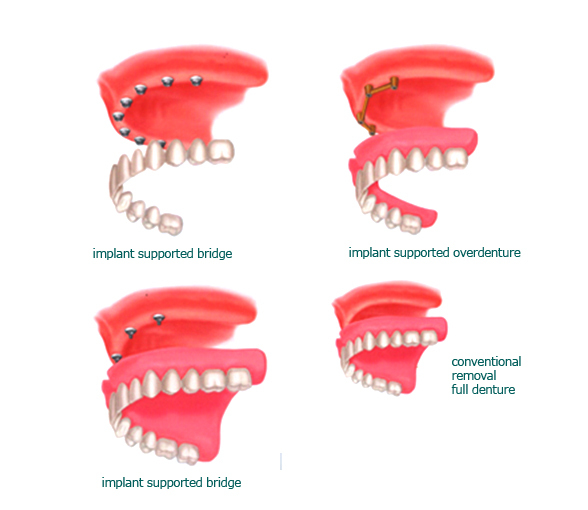 A dental implant is an artificial tooth root made from titanium and can hold a replacement tooth, bridge or a denture. While high-tech in nature, dental implants are actually more tooth-saving than traditional bridgework, since implants do not rely on drilling neighbouring teeth for support. They are so natural-looking and feeling, you will forget you ever lost a tooth. Whether you are missing one, a few, or all of your teeth, implants may be the most natural-looking solution for restoring your smile and ability to chew with comfort and confidence. Our clinic offers two systems in implantology programme: Ankylos and Astra. Each of them has its advantages and indications depending on the plan and goal of the treatment. Implants for single-tooth gaps. Naturally invisible. When the implant is placed it is in exactly the same position as your natural tooth. Particularly where it is not directly visible: Ankylos and Astra implants are designed to imitate the natural root of the tooth. The correct load is applied to the bone and the gum to shape them appropriately. Healthy teeth remain untouched and it is not necessary to grind them down to hold a fixed bridge in place. Small metal clasps around neighboring teeth are also not required as a supplementary retainer, as is required with removable partial dentures. All this is superfluous with implants – an all-round ideal solution. The first stage of every treatment is an intensive consultation. Your dentist will discuss in detail your initial situation, the treatment sequence and what you actually want and will answer your questions. You work with the dentist to define the best solution. The health and cost schedule will include a detailed list of costs for your specific implant treatment. Once the question of costs has been clarified and you have decided to have an implant, the actual treatment can be started. You will find the most important stages below. It normally takes no longer than 30 minutes to place a single implant. The routine procedure is carried out atraumatically under local anesthetic. If the tooth was lost some time previously, the gum over the planned position is carefully opened. Then the surgeon prepares an implant site in the bone and screws the root-analog implant into place. Now the healing phase in the bone starts. The implant should normally not be loaded during these weeks and month. The gum is carefully sutured over the implant. A standard temporary denture covers the site. Healing of wound and bone. The gum normally heals quickly and painlessly. The sutures can normally be removed two weeks after the operation. During the bone healing phase new bone cells are deposited over the implant. Both Ankylos and Astra implants have a unique special microrough and cell-bonding surface structure to encourage this. This means that the implant heals gradually in its optimum position. This process takes four to six months in the upper jaw. The bone in the lower jaw is harder, so the healing process is completed after only three to four months. During this period you will wear an accurately fitted temporary denture, which will be virtually identical to your natural teeth. With some care you will be able to eat quite normally. Implant uncovery. Placement of the crown. Once the implant is securely in position and healed, the gum above the implant is carefully opened again. The implantologist places a gingiva former on the implant. It shapes the gum over about two weeks so it will be in close contact with the subsequent crown – so it will look perfectly natural and there will be no visible gaps. Then an impression of your jaw is taken. 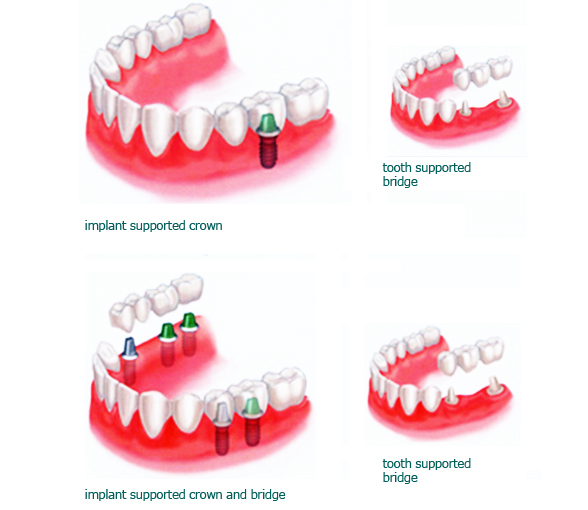 The impression forms the template for fabrication of your customized crown. The implantologist will then replace the temporary denture. After two weeks it is time for the next step. The gingiva former is removed and the final crown is seated. It is screwed tightly and securely to the implant – indistinguishable from your natural teeth. If the dentist finds that your bone situation meets the requirements, immediate loading of the implants is also possible. This means that a very high-quality temporary denture or a prosthesis is attached immediately to the freshly placed implant. 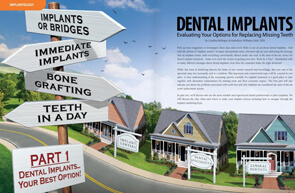 You receive your implant and on the same day you also receive a fixed, natural looking tooth. Ask your implantologist about this option. Implants for larger gaps. Obviously perfect. 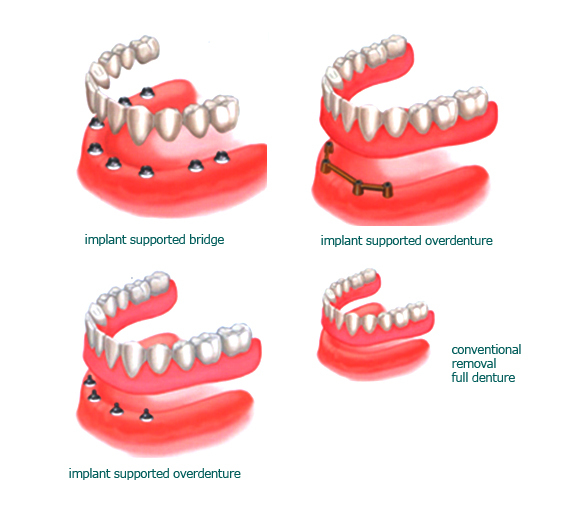 If several teeth in sequence are missing, you can also decide to have an implant-borne bridge. Regardless of your preferred solution, the new tooth roots perform the same reliable function as your original teeth. A customized crown or bridge can close every gap precisely and with perfect esthetics – with no visible difference from your original teeth. Implants. The best solution from any point of view. 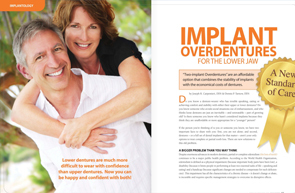 Implants are an excellent solution – attractive, permanent and reliable. Healthy teeth remain untouched and it is not necessary to grind them down to hold a fixed bridge in place. Even if there is a gap at the end of a row – referred to as free-end edentulism – the tiny high-tech screws are the optimum solution. Ankylos and Astra implants are designed to imitate the natural root of the tooth. The correct load is applied to the bone and the gum to shape them appropriately. Visible clasps such as a re used with removable dentures are not required. 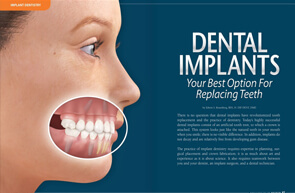 Implants can be placed immediately after extraction of teeth or at any time after. If a gap has been in place for an extended time, the bone may have become too thin or flat because of the lack of loading to hold an implant. In this case the bone can be built up again with tissue from your own body or with material that is identical to bone.